And now for something completely different….. Sometimes I think that I may just have the most random blog in the world. 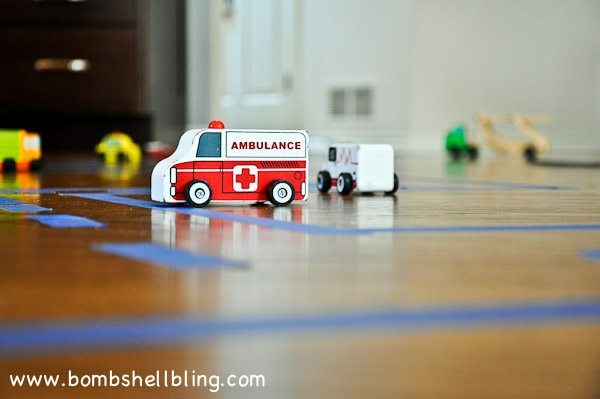 Not really because I’m sure there are some incredibly random blogs out there that are even more random than this one, but every time that I think I’ve found my voice and my niche I decide to throw in a random post on cleaning supplies or a preschool learning game. Then again, I am an incredibly random and scattered (and, frankly, hyper) person, so maybe random IS my voice! Anyway…..today’s post may not be in keeping with bling and holidays and baby headbands, but it is in fact “me.” You may think of me only as the sparkly, over-the-top lady who loves s’mores and Halloween, but the fact is that in my pre-kid life I was an elementary school teacher. I taught third and fourth grade. I have been thinking lately that I should really be using my teaching degree and experience to teach my preschooler more often. I think it often and execute it very little. This week I decided to put my good intentions into action. 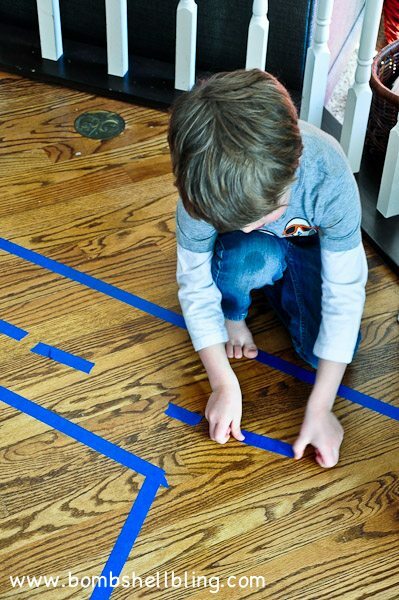 Early in the week my son and I worked together to built a gigantic zig-zaging road through our main floor using painters tape so that it would peel up without damaging the floor or leaving any icky residue. As you can see, he and little sis both had a ball zooming the cars up and down the track. 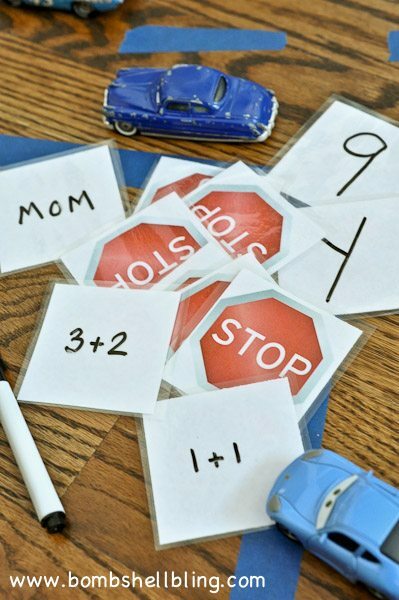 Here’s the idea: spread the stop signs out on the road and each time your child’s car drives up to one of them as it goes down the road it has to stop and you child will answer the question on the back of the stop sign. Once they correnly answer the question they are free to drive on down the road to the next stop sign. Simple, fun, and educational! 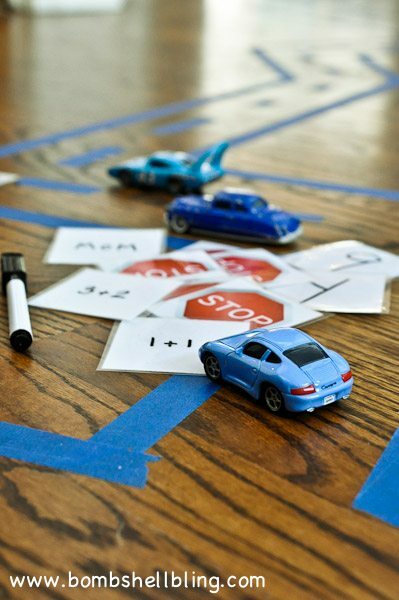 My preschooler loved this learning game WAY more than I anticipated, as you can tell…. Little sis wanted to pretend she was in on the action as well. Nice bedhead, cutie. 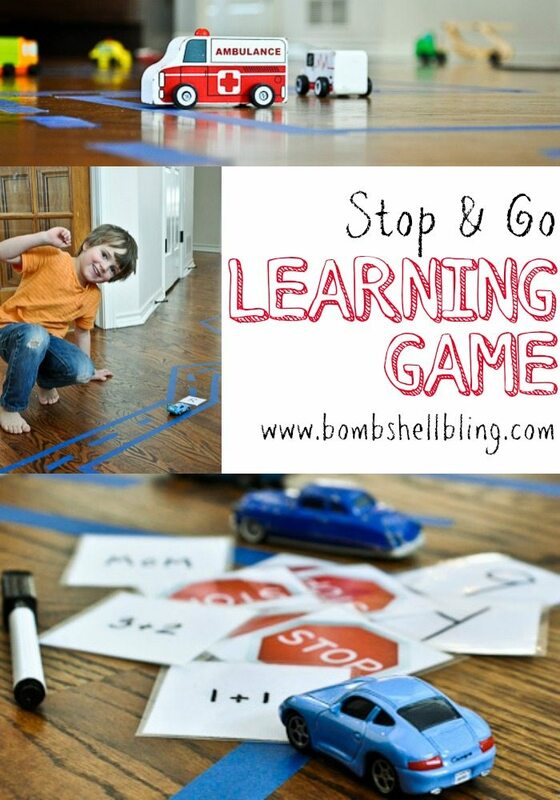 The beauty of this learning game is that you can make it as simple or difficult as you would like! 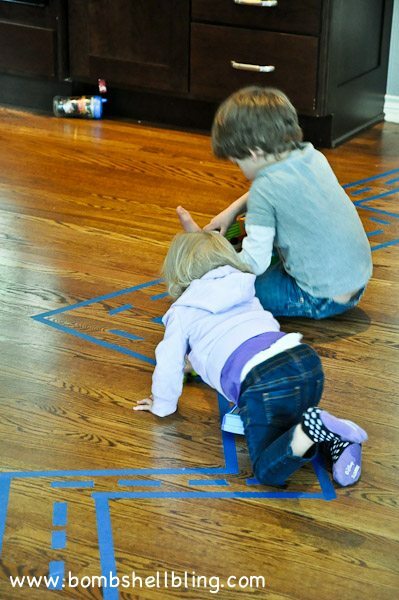 Write the letters on the back and have them identify them or make their sounds. 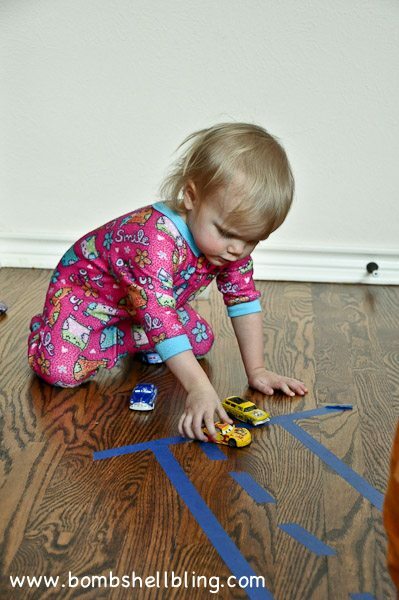 Write the numbers on the back and have them identify them or count until they reach that number. Write simple addition or subtraction facts on the back of them. 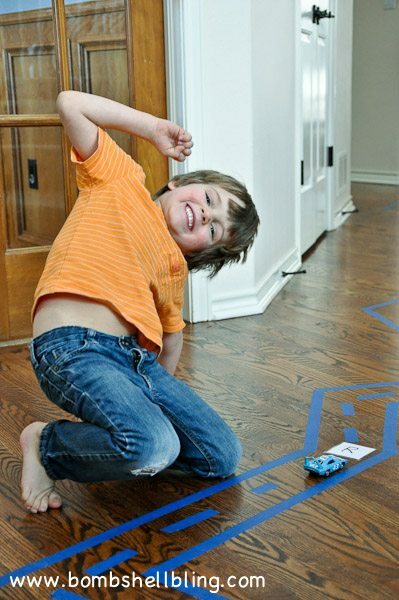 Heck, you could even do multiplication or division facts—-one of my best friend’s second graders love the tape track that I made at their house during our NYE party! For my son I did a mix of exremely simple addition facts, the letters that he tends to have a bit of trouble with and VERY simple words like “MOM,” “CAT,” and his own name. It was the first time we had discussed sounding out words. I had no idea he thought he was supposed to be able to just memorize every word in the world and instantly recognize them because I had never taken the opportunity to discuss it with him! It was a really simple but effective teaching moment for us. 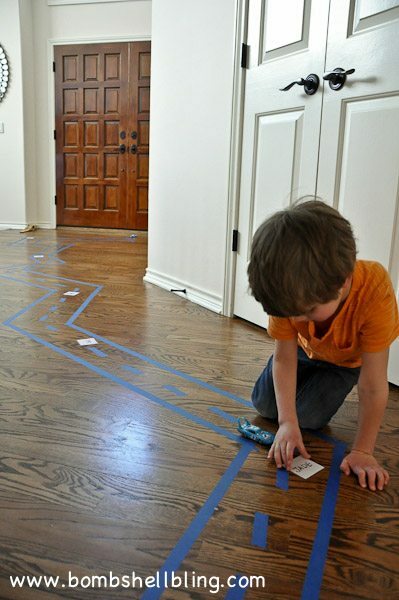 I hope that you give this fun and super simple learning game a shot with your own kiddo. Let me know if it’s a success! Would you like to see more posts like this from me? I appreciate your feedback! Have a lovely day, and be sure to check out the blog hop and giveaway that went up yesterday….not to mention the AMAZING giveaway that is coming on Wednesday! EEEK!! I’m so excited!! TTFN, ta ta for now! That makes me so happy!! Enjoy! I love this! 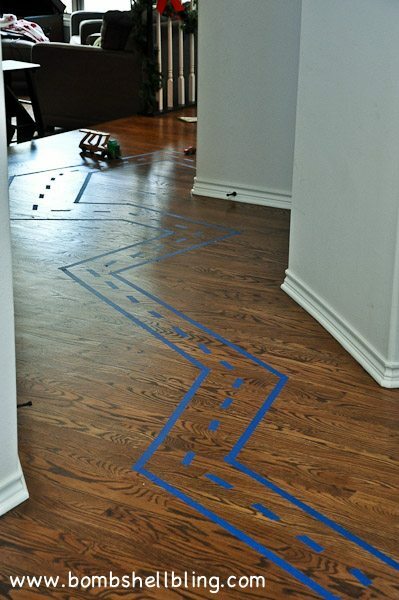 I am going to do this with my pre k 4 class. Also, the cards could be good for standing in line while waiting for someone in the bathroom. I’m officially inspired! Ethan is going to love this! Thanks for the fabulous Idea! Yes! More posts like this!